Our adult choir is a group of volunteers whose desire is to glorify God through song. The choir sings during both Sunday services, and does a special program for Christmas. 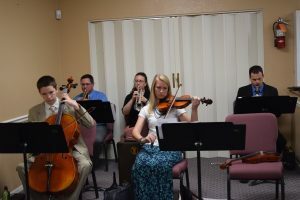 God has also blessed our church with a talented group of instrumentalists who play along with our congregational singing. Our orchestra includes people of all ages, each eager to use their talents for the Lord.